Snakes and humans have had a relationship ever since that first serpent gave someone an apple and caused a whole lot of trouble. Some see snakes as pests and are quick to kill them if they come upon them in the backyard. Others see them as pets. There are more than 2,500 species of snakes, from the tiny thread snake, which grows to less than 4 inches, to the mighty anaconda. Types of large snakes typically sold as pets include ball pythons, boa constrictors and Burmese pythons. If you're considering a large snake as a pet, there are a few things to consider because snake-keeping isn't simple, nor is it for the faint of heart. 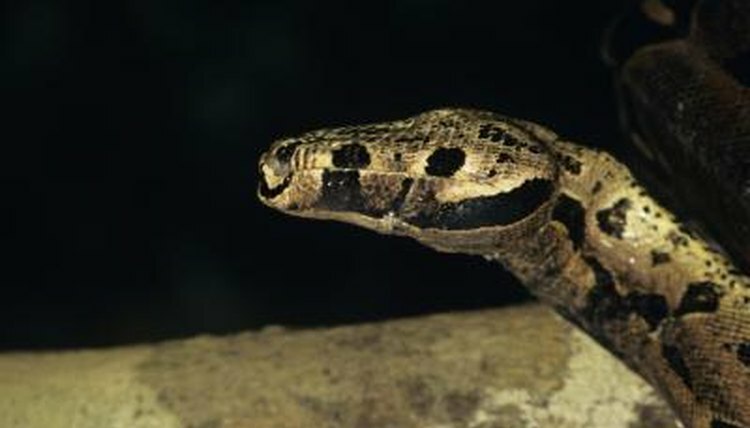 Large snakes usually require live prey, though some will tolerate dead animals. Unless you enjoy watching rats being eaten alive (or dead), a snake may not be the right pet for you. If you have commitment issues, keeping a snake is probably not the best hobby. Snakes live a long time in captivity -- almost 30 years in some cases. If you're 14, you'll probably be 44 before your snake goes to that great rainforest in the sky. You'll have been married and maybe have a family by then -- a family that includes that pet boa or python you bought so very long ago. Many large snakes can grow to 30 feet and weigh up to 200 pounds, so keep that in mind when considering a habitat for the big fella. Some states, including California and Florida, have laws concerning the sale, transport and keeping of large snakes. Many counties and municipalities also have laws to prohibit the sale of large snakes. "It's magical thinking to believe that the baby python you purchase today will still be with you 30 years from now," says David Hitzig, executive director of Busch Wildlife Sanctuary in South Florida. "I get three to five phone calls a day from people who have large snakes they need to re-home. We can't take them, and it's illegal to release them into the wild, so now what?" In many states it's a misdemeanor to release domesticated or exotic animals into the wild. When boas and pythons are released into environments where they don't belong, they can wipe out native species. In the Florida Everglades, the snake problem became so severe that Fish and Wildlife managers had to stage a hunt. More than 1,500 people spent several days in January 2013 trying to rid the Everglades of boas, pythons and, in some cases, venomous snakes that had been released by people who could no longer keep them as pets. Native animals such as the endangered Key deer and even pets were being eaten by snakes never meant to live in the United States. If your heart is set on a large snake as a pet, educate yourself so there won't be any surprises. Talk to snake experts and owners for advice. Learn about feeding schedules and habitat requirements. In some cases, you'll need to provide a live animal, such as a rat, mouse or baby bunny, every 10 to 14 days. Find an exotic pet veterinarian, since not all vets accept large snakes, which can fall victim to many bacterial, fungal, viral and parasitic diseases. Remember your snake won't finish growing for three years or so, so be prepared to upgrade his habitat from time to time. Consider a smaller snake instead, to make sure this is a commitment you want to make. Corn, garden and rat snakes are less expensive to raise. They're also a lot less dangerous. Check with local authorities to secure necessary permits and, if possible, find someone who needs to re-home a snake or visit Petfinder to rescue a homeless snake rather than go to a pet store or breeder. Reptile Knowledge: How Fast Does A Ball Python Grow? Why Are There Not Snakes in Ireland? Are There Snakes in New Zealand?